Denen Studien nevner mange interessante ting om Resting Energy Expenditure, altså energien kroppen bruker til å reparere seg etter trening. Vanligvis bruker kroppen 60-75% av energien bare på å opprettholde en fysiologiske funksjoner under hvile, mens i 72t etter trening kan den økes med 6%, eller ca. 420 kJ. Denne studien viste at det var lite ekstra økning om man gjorde en enkelt 15 min økt, eller om man gjorde det 3 ganger. Heden et.al. 2011. 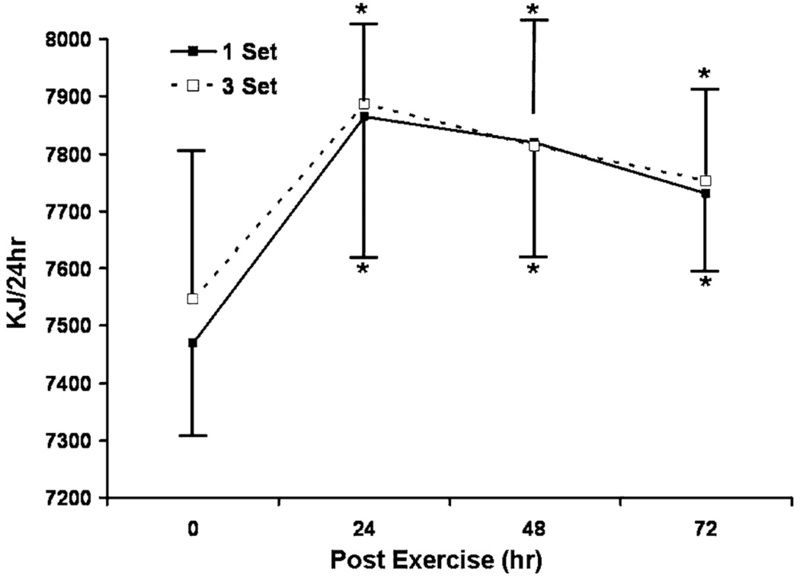 One-set resistance training elevates energy expenditure for 72 h similar to three sets. Resting energy expenditure (REE) accounts for approximately 60–75% of an individual’s daily energy expenditure (Dolezal and Potteiger 1998; Hunter et al. 2000; Lemmer et al. 2001; Pratley et al. 1994). Determining modalities that increase REE is important as small perturbations in REE can have a significant impact on the regulation and maintenance of body weight (Dolezal and Potteiger 1998; Hunter et al. 2000; Lemmer et al. 2001; Pratley et al. 1994). Unlike aerobic exercise, which results in significant increases in energy expenditure during, and for a short time following cessation of the activity, the energy expenditure during resistance training (RT) is relatively low (Melby et al. 1993; Phillips and Ziuraitis 2003), but the increase in energy expenditure after the cessation of the activity and between RT session may be elevated (Dolezal et al. 2000; Melby et al. 1993; Taaffe et al. 1995). The REE also corresponds pretty good to the progression of DOMS. But is also, as anything else we have looked at, not correlated to the intensity of DOMS. Results indicated that both the RT protocols elevated REE by ~ 420 kJ (6%) after 24 h in absolute and relative to fat-free mass and this elevation was maintained in both protocols for 72 h post RT bout. The results of this investigation support the current ACSM recommendation for RT, which is one set of eight to ten exercises focusing on the major muscle groups (Haskell et al. 2007). Although this recommendation is most often cited for overall muscular fitness, the fact that a single set can elevate REE for 72 h may be an important modality for weight management. The importance of increasing REE may be with the interaction between REE and energy balance. Increasing REE sufficiently could possibly result in a negative energy balance that could prevent an increase in fat mass. These factors include elevated body temperature, resynthesis of glycogen from lactate, ion redistribution, replenishment of oxygen stores in blood and muscle, resynthesis of adenosine triphosphate and creatine phosphate, circulation and ventilation, and residual hormone effects (Bahr 1992; Bangsbo et al. 1990; Borsheim and Bahr 2003). However, it seems that these processes are associated with temporary elevations and do not explain prolonged REE elevations observed beyond 24 h post exercise (Bahr 1992; Bangsbo et al. 1990; Borsheim and Bahr 2003). For, example, although not measured in this study, myofibrillar protein turnover (Kim et al. 2005) could increase REE and has been shown to account for as much as 20% of REE (Welle and Nair 1990). In addition, sympathetic nervous system activity may be related to changes in REE. For example, low volume RT has been shown to increase muscle sympathetic nerve activity (Pratley et al. 1994) and to elevate rates of muscle protein synthesis and breakdown up to 48-h post-exercise. Finally, changes in insulin or IGF-1 may contribute to alterations in the repair and resynthesis of skeletal muscle that may contribute to an elevation in REE beyond 24 h (Nindl et al. 2009).